As you know if you read yesterday's post, I love being out in my yard and watching the progress of my plants. I am such an amateur but I am learning. I add small additions each year but my landscape is slowly but surely making progress. I have so much more to do--I can envision my entire yard in my mind--but it will continue to be a work in progress. Stop working before you are tired. Eat before you get hungry. And never work on Sunday. I should heed that last one more often. This morning I took another stroll through the yard. I'm not planning to do much work today, just take things at a leisurely pace. I made these discoveries. 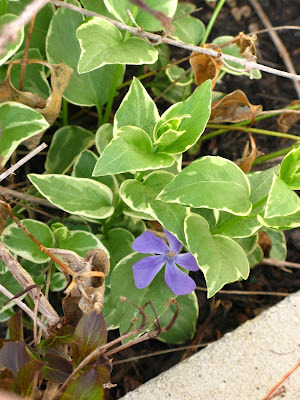 I didn't know that vinca vines bloomed! This one has been growing voluntarily for about three years. First bloom I've seen. See it hiding there underneath the azalea? I think this is basil. Not sure. 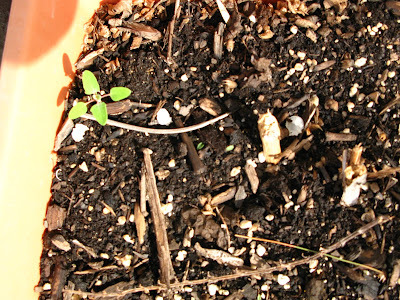 I let some of the plants reseed themselves and I even saved some of the seed. It could be a weed. I'm not sure. But I am hoping for basil. 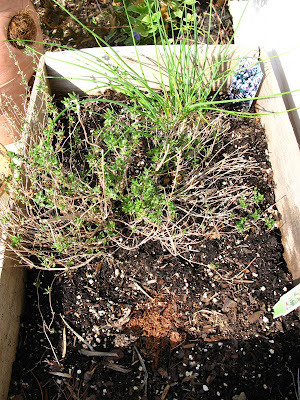 My chives and thyme are coming right along! 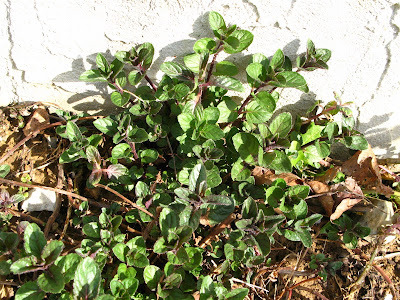 As is the chocolate mint I transplanted last year from around the pond at my parents' Ohio farm. 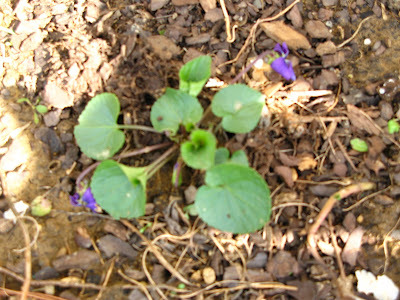 As is this Ohio violet, also transplated. 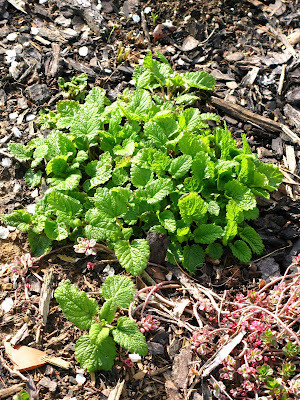 And the lemon balm I put out last year. Yes! Then, where there were two, there are now three. 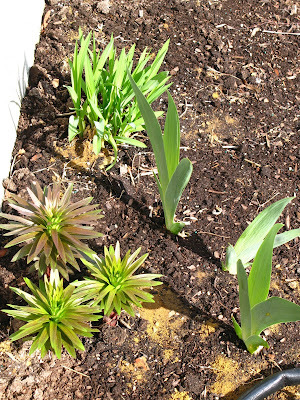 Star lilies, a gift from George the neighbor, and Iris from my sister. I love watching things grow. Amateur gardening question of the day: When you buy a new hoe, is it the expectation that you must sharpen it when you get home? The one I bought yesterday appears might dull. Sort of defeats the purpose in chopping out those weeds... And then, if that is the expectation, how do I sharpen the darned thing? I think they usually start out pretty dull, and working them in the dirt actually sharpens them. You'll have a certain way you like to hold your hoe, and you'll see that side wear quicker. Be sure to rotate how you hold it. My grandmother has had the same hoe for almost 20 years, and it's almost worn completely away, but she likes the feel of it. Ohhhhh!!! Using it is important? I thought buying it was a big deal. LOL Seriously though, I put it to good use yesterday afternoon. I think I have the hang of it! And so much nicer than pulling the darned weeks and grass up by hand. I'm trying to dig up a new flower bed. Thanks, Jennifer!